Eurostars Executive was born in the epicentre of the area of greatest corporate density on the Iberian Peninsula, in the heart of the Vallés district. 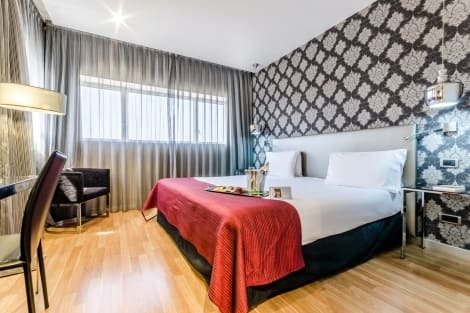 This elegant hotel is located a few metres from the centre of Barberá del Vallés, and 15 km from Barcelona by motorway (AP7 and C-58) and by bus, with stop in front of the hotel every 30 minutes (25 minute drive). It also has a RENFE train station in a 10-minute walk, with a frequency of 10 minutes, which links the Eurostars Executive with the centre of Barcelona. This design hotel offers all the comforts for our clients' convenience. We adapt to all circumstances: at the Eurostars Executive you will also find an appropriate space for holding small, private meetings. There is no area on the Iberian Peninsula with a higher business density than the Vallés. In the nerve centre of this great financial belt the silhouette of the Exe Barberà Parc hotel rises high to offer an excellent stopping place for your rest and comfort. The hotel is endowed with all the comforts for the business client: a large outdoor car park area, 2 large meeting rooms, a VIP lounge, free Wi-Fi connections throughout the building, rooms with work tables and suites with sitting rooms to hold small business meetings. It is located in the town of Barberà del Vallès, just 15 km from Barcelona by motorway (AP7 and C-58) and 17 km from the Circuit de Catalunya (Moto GP and Formula 1). lastminute.com has a fantastic range of hotels in Barbera del Valles, with everything from cheap hotels to luxurious five star accommodation available. We like to live up to our last minute name so remember you can book any one of our excellent Barbera del Valles hotels up until midnight and stay the same night.